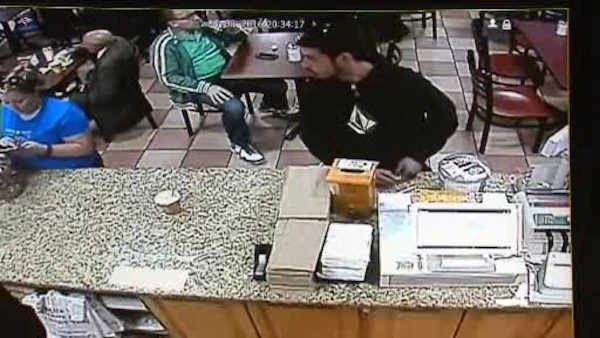 NEWARK, New Jersey (WABC) -- Police say they have made an arrest in the theft of a cancer donations box from a bakery in Newark. Newark Public Safety Director Anthony Ambrose announced the arrest of 23-year-old Newark resident Daniel F. Santos. Two police officers were dispatched to a business shortly before 7:30 Sunday morning after police received a tip that Santos was on his way to work. He was arrested without incident and charged him with theft. Police credited extensive media coverage of the theft with helping to lead to a quick arrest. The incident happened around 8 p.m. on June 8, when authorities say the suspect stole a box meant for taking donations for a colon cancer patient from the Ferry Street business. The bakery was full of customers at the time, and according to the bakery owner, the box had close to $200 inside. The patient, a single mother, is from Bethlehem, Pennsylvania.